Blueprint for the Future: Latvia from 1934 to 1941, written by Chairman of the Harmony Centre party in Latvia Janis Urbanovics, INSOR Management Board Chairman Igor Yurgens and author Yuris Paiders, was presented at the Baltic International Academy in Riga. 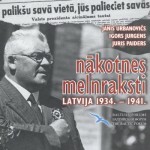 The book was published earlier in Latvian (Nākotnes melnraksti. Latvija 1934.-1941.) and it caused a number of debates and discussions. The book is available free of charge on the Internet and is published by the Baltic Forum. The book is written in the form of a dialogue-discussion between the three authors. The Russian version of the book is 543 pages and it includes more than 200 historic documents translated into Russian, archive photos, photocopies of government decrees, public speeches by Latvian politicians, diplomatic reports and the recollections of major historical figures of that period.